David and I decided not to exchange Christmas presents this year- instead, we gave each other our fabulous little November road trip to Seattle, Vancouver, Northern California and San Francisco. But, of course, as Christmas day drew near, we got a little nostalgic and decided that we wanted to be able to wrap something up for each other to put under the tree this year. You know, more fun, less Grinch. So we decided to give gifts, but with a caveat: any gift we gave to each other had to be F.R.E.E. And no, not like re-gifting free, but more like "I made this for you because I love you very much" kind of free. I made David a 2011 calendar, complete with adorable little inside jokes for each month. But, as cute as my calendar was, David totally won in the awesome gift department. He apparently was paying attention when I was drooling over all of those fabulous coffee table trays I've seen out in blog land. And so... he made me one! Well, two actually! With *free* pieces of scrap wood that he found in our basement, David put his woodworking skillz to work and made me these two beautiful trays! Aren't they great? 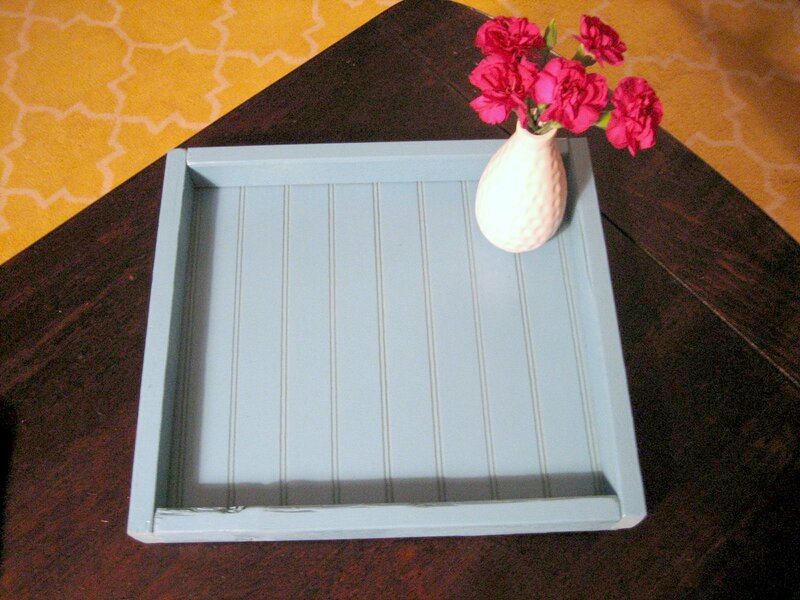 spray paint and decided to bring a new life to one of my beautiful new trays. 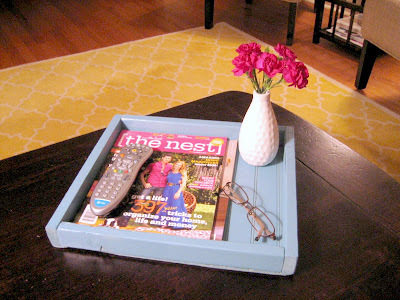 I'm loving the punch of color that it brings to our living room, as it sits on our coffee table. These are so nice and so very thoughtful of your hubby! What a nice hubby! I got new carharts for the garage! Best GIFT ever! He's a keeper for sure. How sweet. Aww, adorable and so special. Wishing my hubby could pick up a tool, any tool! Love them! What a fantastic gift!! Oh, and make sure he signs the bottom. So neat, love the color, looks great on your coffee table! He's a keeper! It's beautiful! He is very talented, and I love the color you sprayed it. ps - I have the yellow Moorish Tile rug in my dressing room, don't you just LOVE it? That is so sweet! Lucky you to have a hubby that can MAKE something! This is too cute! I love the color! That is so sweet! I love the blue color you chose. I want to see the calendar you made him too! I like it! it's fresh! starting every monday over at www.tootsiewootsieboutique.blogspot.com there will be giveaways and linky parties! so come and join in for some fun and inspiration! 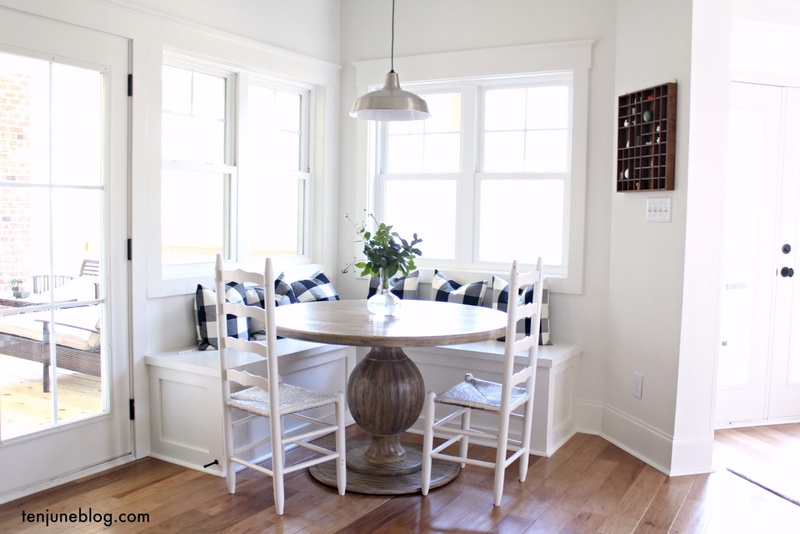 I love all of this - the beadboard bottom, the color combo, the sentiment, all of it! Ooooh I love the color! What a sweet hubby you have! Hey there! I'm a new follower! I love this little tray, its too cute! What a fabulous idea for scraps. And what a great husband. Score! Love the color you chose, too. I'm new here, but can't wait to look around. Stumbled across you thanks to "Under The Table & Dreaming".